I’ve written this post and this post about Al Franken’s fundraising appeals. Mostly, Franken’s fundraising appeals have been long on Karl Rove, the Koch brothers, the TEA Party and Citizens United. In other words, they’re a collection of the Democrats’ favorite boogeymen. We are well over eight months away fron Election Day 2014, yet Alan Grayson is already invoking each and every one of the Left’s boogeymen in his fundraising appeals. It’s only February, yet Grayson has already issued pro-forma denunciations of Fox News, Sean Hannity, the energy sector, has compared the Tea Party to the Ku Klux Klan, and most recently, has smeared our veterans while attacking the eeeeeeevil Koch Brothers. 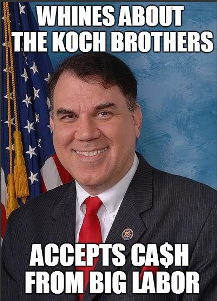 Of course, such attacks are pure hypocrisy coming from Alan Grayson. The non-partisan and independent Center for Responsive Politics is dedicated to tracking the influence of money in our election process, and they have compiled a list of the largest political donors over the last 25 years. The scary “Kochtopus” is all the way down at #59. But who occupies most of the top spots? You guessed it…Grayson’s Big Labor buddies. A quick crosscheck with Grayson’s top donor list confirms this inconvenient fact. Apparently, the Congressman Without Guts feels compelled to insult our intelligence (as well as that of his own individual donor base) by performing this “outrageously tough progressive” shtick, which now includes this Koch theater. It doesn’t take a rocket scientist to notice a pattern developing. Even intellectual midgets like Franken and Grayson could spot it. What’s obvious is that Democrats will go totally negative this election. They’ll criticize the entire panoply of conservative ‘boogeymen’ for this nation’s ills rather than admit that it’s their policies that’ve failed. They’ll do whatever it takes to distract people from the ACA disaster. They’ll insist that they’re pushing back against President Obama and ‘holding him accountable’ for the disastrous performance of HealthCare.gov while criticizing Republicans for wanting to repeal the law that’s causing health insurance prices to jump. The Democratic playbook for this election is simple. To hold onto the U.S. Senate, Democrats will attempt to portray Republicans as utterly beholden to special interests out to destroy America’s middle class. They’ll do this while accepting money from environmental organizations while pretending to be friends of the private sector unions who want to build the Keystone XL Pipeline. Their message will essentially be ‘Don’t vote for Republicans because they’re scary.’ Meanwhile, they didn’t notice that they’re the ‘Scary Characters Party’. While it’s too early to predict the Franken and Grayson races with anything approaching sanity, it isn’t too early to predict that this won’t be a good year for Democrats. The only thing left to determine is how bad it’ll be. Have you heard of American Crossroads? It is a super PAC that spent more than $104 million in the 2012 elections. Apparently, they’re getting ready to spend big again. And the man behind the Crossroads curtain is none other than Karl Rove — who recently called me out by name and pointed to Minnesota as a pickup opportunity for Republicans in 2014. Crossroads is firing up the attack machine. We need to be ready to fight back. And this month, that means hitting our $200,000 goal. Can you give $5 or more before the deadline? American Crossroads is one of those groups spawned by Citizens United. And let me tell you, Rove and his pals have a great reason not to like me. It’s not because they don’t like my jokes. They know I don’t support the special interest, anti-middle class, Karl Rove agenda. I support the protecting Medicare, preserving net neutrality, reversing Citizens United agenda. I work for families, not super PACs. They may have millions of dollars to spend on attacks, but I’ve got something better: You. I know you are all committed to strengthening our grassroots efforts. So let’s make sure we’re ready for whatever Rove can throw at us. Give $5 or more toward our $200,000 goal today. Thank you for your help this month. For all his whining about Karl Rove’s special interest, anti-middle class policies, Franken has voted for initiatives that’ve left the middle class working part-time or part of the army of chronically unemployed people who’ve been searching for jobs since 2009. Sen. Franken, why haven’t you supported the Keystone XL Pipeline project? The State Department’s report says environmental impact will be minimal. Is it because you’re beholden to anti-science militant environmentalists? Apparently, you don’t give a damn about blue collar workers who would be put to work building that pipeline. Sen. Franken, why haven’t you supported the PolyMet precious metals mining project in your own state? Is it because you won’t say no to Minnesota’s militant environmentalists? Is it because you only support blue collar union miners in word, not deed? That’s the definition of being controlled by anti-middle class special interests. Minnesota deserves better. Minnesota deserves a senator who’ll fight for the middle class. I’ve said for awhile that the big thing propelling Newt’s rise is his obeying Reagan’s 11th Commandment. I’ve had plenty of company. This article by Jed Babbin is the best written piece on the subject. Mr. Babbin’s article also did a nice job explaining Mitt’s fall. Gingrich’s staying power has the Washington cognoscenti frustrated. When the Romney campaign launched its attacks on Gingrich, there was a flood of seemingly coordinated press promoting the attacks. In response, Gingrich had two New York press avails, looking friendly and presidential. And, in a now much-reported conference call with his staff, the former Speaker ordered them to avoid going negative. Newt’s support keeps growing because he hasn’t attacked the other GOP presidential candidates. He’s hit back hard but he hasn’t attacked. Let’s remember that an attack is an offensive action. Defending yourself is the expected response against an offensive action. Another thing that’s helped Newt is that Gov. Romney’s, Dr. Paul’s and Rep. Bachmann’s attacks are either wimpy, old news that activists have already factored in or that seem more vitriol than substantive. The political consultants working against Gingrich seem unable to absorb facts or adapt their ideas to them. One of the biggest criticisms of Gingrich is his inability to organize staff and run a campaign. Karl Rove wrote what was supposed to be a devastating criticism of Gingrich’s leadership deficiencies in the Wall Street Journal last week. Rove said, among other things, that Gingrich had failed to qualify for the ballot in both Missouri and Ohio and that the former House speaker had little or no organization in Iowa. Rove’s article would have been devastating but for one fact: it wasn’t true. Gingrich has, for example, qualified in both Missouri and Ohio. His Iowa staff is strong and getting stronger by the hour. It’s as if people haven’t figured out that people are thirsting for a statesman with some gravitas and a sense of humor. Herman Cain didn’t have any gravitas. Ron Paul, Mitt Romney and Michele Bachmann aren’t statesmen and their sense of humor hasn’t shown through in the debates. I just spoke with Matt McClellan, the Communications Director for the Elections Division in the Ohio Secretary of State’s office to confirm that Newt had qualified that he’d be on the Ohio primary ballot. Matt said that there’s a new law taking effect on January 20 on the Ohio presidential and congressional primaries. Matt confirmed that Newt had met the original Dec. 7 deadline. He then said that when the law takes effect, all of the candidates will have to refile for the March Ohio primary. In other words, Newt’s supposed missin the Ohio Primary filing deadline is a myth. When Gingrich said that school kids, especially those in poor families, could work in schools to learn the habits of reliability and earning, the media jumped on him. But people understood that Gingrich was right. Young Americans don’t have the work ethic of their parents or grandparents. This shocked the undies-in-a-bunch media but it’s something that the heartland understood immediately. Which brings me an important point that can’t be overemphasized. Where people get their news from matters because it determines what their policies will be. If people get their information from the NYTimes, CBS News and the Washington Post, they’re likely to be moderate to liberal. People that get their information from their own research, talking with experts and a portion of their information are likely well-informed, center-right to conservative. Mitt likely gets most of his information from the Washington Post, CBS News and the NYTimes. Newt’s always talking with people in various industries, reading studies and reports. That’s why he’s always the most-informed candidate on stage. That tells you why Mitt’s the inside-the-Beltway candidate and Newt’s the Heartland candidate. Prior to the 2006 midterms, Karl Rove highlighted the plan to maintain control of Congress. The Architect said that 2006 would be about presenting the electorate a choice between the Democrats and congressional Republicans. As they say, the rest is history. Ask David Plouffe how Democrats can recover from their electoral setbacks over the past few months and he has a simple answer: Republicans. That choice was made explicit far too late in last month’s special Senate election in Massachusetts between then-state Sen. Scott Brown (R) and state Attorney General Martha Coakley (D), Plouffe noted. “Everyone would agree that the definition of Brown should have happened a lot sooner and a lot more clearly,” he said. Voters now trust Republicans more than Democrats on nine out of 10 key issues regularly tracked by Rasmussen Reports. But the latest national survey finds that the two major political parties are much closer this month on the top issue of the economy. Forty-six percent (46%) of voters trust the GOP more on economic issues, while 42% trust Democrats more. Another 12% are undecided. Last month, Republicans held an 11-point edge on the issue and had a 12-point lead in November. On health care, Republicans are trusted more than Democrats by 49-37 percent, a 12 point margin. Republicans lead Democrats by a 50-34 percent on the issue of taxes, which will grow in importance as the expiration date of the Bush tax cuts draws near. This statistic should scare Democrats the most: Likely voters trust Republicans by a 45-35 percent margin ON SOCIAL SECURITY!!! What is clear, however, is that Plouffe has been assigned to apply his meticulous, detail-oriented approach to competitive races across the country, ensuring that the White House and the DNC do everything they can to sniff out problems and offer solutions, and not be surprised by another Scott Brown. The DNC better raise alot of money quickly because Mr. Plouffe will need lots of staff this year. There’s gonna be alot of races needing Mr. Plouffe’s attention this summer. Plouffe, aware of the challenges for Democrats, said that if people know both the “positive” Democratic story and the “comparative” message against Republicans, the predictions of political Armageddon will be far short of the reality this fall. This weekend, I’m doing the final revisions on my new book “2010: Take Back America, a Battle Plan” and I finished writing the section on the House races last month. And now they sent me the galleys for me to correct. And I listed 35 possible tight races. I went through it again, looking at the modern polling and we’re up to 60 tight races. Like Kirk in Illinois was 6 points behind and now he’s 6 points ahead. It’s unbelievable the changes. It’s important that we remember that GOP candidate recruitment is still a work in progress. As more polling shows that the Democrats are in trouble, the easier candidate recruitment gets for Kevin McCarthy and John Cornyn. If things keep improving for Republicans but at a slower pace, Plouffe will have 75 competitive races to deal with on a daily basis. Anyway, thereâ€™s a pattern here: Coakley carries districts where Obama got 65% or more of the vote and runs essentially even in the district where he got 64%, and Scott Brown runs ahead in districts where Obama got less than 64% of the vote. Letâ€™s extrapolate those numbers to the nation as a whole and assume that a district that voted 64% or more for Obama is safe for Democrats even under the most dire of circumstances. How many such districts are there? Answer, according to this source: 103. Some troubling news for Sen. Evan Bayh, D-IN? Maybe. A poll conducted for the National Republican Senatorial Committee shows that the two-term senator may be vulnerable to a challenge, presumably from former senator Dan Coats (R-Ind. ), largely because of voter dissatisfaction with the Democratic health-care legislation and the flight of independents from the Democratic Party. The survey, which was conducted by GOP pollster Kellyanne Conway, showed that six in 10 Indiana voters oppose the health-care plan and 32 percent support it. And the opposition to the legislation is passionate, 48 percent said they strongly opposed the measure passed by the Senate. Independents, who voted heavily for Obama and helped him shock the political world by carrying the Hoosier State in 2008, have swung in the opposite direction in the Conway poll; 40 percent said they would vote for an unnamed Republican candidate for office and 19 percent chose an unnamed Democrat. Sen. Bayh has always touted himself as a centrist. That isn’t possible anymore because after voting for President Obama’s failed stimulus bill and for Pelosicare. Saying that you’re a fiscal hawk after voting for a pork-filled stimulus bill that was about paying off the Democrats’ political allies and voting for a huge new entitlement program isn’t the way to maintain credibility as the taxpayers’ watchdog. In normal years, Sen. Bayh’s seat wouldn’t be on the radar. Now, his seat is definitely in play. That’s the bad news. The worst news is that his isn’t the only seat where an established Democrat is in trouble. Harry Reid, Barbara Boxer and Patty Murray are in trouble, too, to varying degress. Whatever happens this fall, Mr. Plouffe will work his behind off trying to stave off a disaster. It’s impossible to argue that the Democrats, including the Obama administration, play the ‘everything is President Bush’s fault’ card. In fact, it’s become a daily drumbeat message. The bad news for Democrats is that the law of diminishing returns is affecting that message’s effectiveness. In truth, the president met with congressional Republicans to talk about the stimulus package the day before the press said Speaker Nancy Pelosi and House Appropriations Committee Chairman David Obey completed drafting the 1,073-page bill. What occurred was a photo-op, not an exchange of ideas. Democrats at both ends of Pennsylvania Avenue were scornful of Republican input. People are noticing that Republicans put substantive alternatives together on the stimulus bill, health care and energy policy. They’re noticing that the Republicans’ plans are appealing. They’re noticing that Republican candidates like Scott Brown and Bob McDonnell ran on a solutions-laden agenda. The myth that the GOP is ‘the party of no’ is fading, too. Independents are noticing that the Democratic Party is the ‘Party of No Ideas’, which is why they’re fleeing the Democratic Party in droves. But of course Mr. Obama and his people have said that repeatedly. They did so starting in April, when White House aides swarmed Sunday talk programs to label the GOP the “party of no” and say that the party lacked both constructive ideas and vision. The ‘Party of No’ meme was this administration’s justification for not including Republicans in health care or stimulus bill negotiations. Team Obama has been on history’s biggest spending spree, which has included a $787 billion stimulus, a $30 billion expansion of a child health-care program, and a $410 billion federal spending bill that increased nondefense discretionary spending 10% for the last half of fiscal year 2009. Mr. Obama also hiked nondefense discretionary spending another 12% for fiscal year 2010. These figures aren’t fiction. They’re verified through the Budget committees. This information has been repeatedly used in newspaper articles. Yes, President Obama inherited a mess. No, the deficits aren’t President Bush’s fault. You can’t blame President Bush for bills passed after he left the White House. PERIOD. End of sentence. Independents know that. That’s why this administration’s whining about how President Bush ruined everything doesn’t play in Peoria. Until President Obama comes up with an appealing common sense agenda and until President Obama stops whining about the Bush administration, the Democrats won’t snap out of the tailspin they’re in. If you haven’t read Karl Rove’s WSJ article yet, then it’s important you consider it today’s must reading. The Architect outlines the perfect storm heading straight for the Democrats in 2010. It isn’t likely to be a pretty sight. Mr. Obama’s problems are legion. To start with, the president is focusing on health care when the economy and jobs are nearly everyone’s top issue. Voters increasingly believe Mr. Obama took his eye off the ball. There isn’t a day that goes by where President Obama says that fixing health care will fix our economy. While there’s no doubt that getting health care under control will improve businesses’ bottom lines, it’s equally true that there’s more to creating a vibrant economy than fixing health care. Adding to the size of government takes money out of the private sector and permanently puts it into government. That’s never the right way to strengthen the fundamentals of an economy. Obama’s administration will take more money away from the private sector in the first 24 months than President Bush did in eight years. Families believe they will be pushed into a government plan as the “public option” drives private insurers out of the market. Health-care providers fear they’ll be forced to follow one-size-fits-all guidelines drafted by bureaucrats, instead of making judgments for specific patients. And seniors are afraid of Mr. Obama’s plan to cut $500 billion from Medicare over the next decade, including $177 billion for Medicare Advantage. It’s simply not possible to cut that much from Medicare without also cutting services seniors need. That last paragraph is putting grey hairs in Democratic strategists’ heads. If there’s any group that Democrats can’t afford to lose, it’s seniors. They’re currently losing seniors and independents by wide margins. If this trend continues, 2010 will be a difficult year for Democrats. Rangel might survive this scandal but I’ll guarantee that he’ll be the poster child for the Democrats’ culture of corruption, along with John Murtha, and William ‘Cold Cash’ Jefferson. If Republicans are smart, they won’t use these gentlemen only as proof that Democrats are corrupt but that their leadership team is utterly corrupt and can’t be trusted on important issues like taxes and out-of-control spending. That’s how perfect storms get built. So what’s a president to do when the promises he made about his economic stimulus program fail to materialize? If you’re Barack Obama, you redefine your goals and act as if America won’t remember what you said originally. That’s a neat trick if you can get away with it, but Mr. Obama won’t. His words are a matter of public record and he will be held to them. In February, Mr. Obama said this about the goals of his stimulus package: “I think my initial measure of success is creating or saving four million jobs.” He later explained the stimulus’s $787 billion would “go directly to…generating three to four million new jobs.” And his Council of Economic Advisors issued an official analysis showing that the unemployment rate would top out in the third quarter of this year at just over 8%. President Obama is pretending that ARRA “has worked as intended.” Unemployment has jumped from 7.6 percent to 9.5 percent, a 25 percent increase since the bill’s enactment and since we aren’t close to 4,000,000 jobs being saved or created or a combination thereof. As is Mr. Obama’s habit, he has answered his critics by creating straw-man arguments. In last weekend’s radio address, he attacked detractors as those who “felt that doing nothing was somehow an answer.” But many of Mr. Obama’s critics didn’t feel that way. They offered, and Mr. Obama almost completely ignored, constructive ideas to jump-start the economy. For example, House Republicans offered an alternative recovery package of immediate tax cuts and safety-net measures that cost half as much as Mr. Obama’s stimulus program. Republicans have also calculated that their plans would have created 50% more jobs than the stimulus. They reached that estimate by using the same job-growth econometric model that the president’s Council of Economic Advisors used for the stimulus. There’s a reason why President Obama’s JA ratings have dropped. People don’t trust him like they did when he first got in office. Too often, President Obama has promised people things that he’s later failed to deliver on. That’s the shortest path to a credibility problem that I can think of. President Obama’s first 6 months in office is marked with lots of stumbles and few successes for the American people. If that doesn’t change soon, Democrats will have to defend President Obama’s revisionist history during the 2010 campaign. Good luck with that. Which Article Should We Trust? For the past few months, political analysts and demographers have been poring over the results of the 2008 election and comparing them with presidential results from the past two decades. From whatever angle of their approach, age, race, economic status, geography, they have come to a remarkably similar conclusion. Almost all indicators are pressing the Republicans into minority status. Republicans are still capable of winning individual elections, but until they find a way to reverse, or at least minimize, these broader changes in the country, their chances of returning to majority status will be severely reduced. After enjoying months of towering poll numbers, legislative victories and well-received foreign policy initiatives, the White House has become increasingly concerned that President Obama’s spending plans, which would require $9 trillion in government borrowing over the next decade, could become a political liability that defines the 2010 midterm elections. The concern was reflected in the aggressive response from administration officials to criticism that money from Obama’s stimulus plan is arriving too slowly to help the languishing economy, as well as in the president’s public endorsement of “pay as you go” legislation, which would require Congress to make room for new non-discretionary spending with equivalent cuts to other parts of the budget. Yesterday, Obama also outlined billions of dollars in savings that would be used to pay for his health-care reform proposal. I’ve never bought into the ‘demographics is destiny’ argument, especially since it’s been disproved too many times. Issues and events matter, as does quality of candidates. This cycle, Republicans have recruited alot better candidates than have Democrats. Add into this the fact that Democrats have some difficult policies and alot of vulnerable seats to defend and you’ve got a recipe for electoral disaster for Democrats in 2010. People are getting either scared or angry at the thought of this administration firing CEOs and nationalizing major corporations. They don’t like the Democrats’ out-of-control spending and they don’t like the prospect of staring at a major inflation spike in the near future. Consumers are already getting wary of the interest rate increases. Then factor in the latest Rasmussen polling showing more people trust Republicans on properly handling the economy than Democrats. After factoring all those things in, it’s difficult for thoughtful people to not disagree with Mr. Balz’s premise. The GOP’s problem isn’t demographics. It’s they stopped behaving like conservatives. They got complacent. They stopped being the party of ideas. Such things matter. ALOT. Mr. Balz looks only at the statistics. He should’ve looked at the causality, too, to figure out the driver for the statistics. I’m not saying that everything is fixed within the GOP. It isn’t. What I’m saying, though, is that the Democrats’ policies have hurt their standing with independents. I’m also suggesting that the best way for Republicans to do well with Hispanics isn’t through immigration or treating Judge Sotomayor with kid gloves. It’s best achieved by understanding that a huge portion of the Hispanic vote are deeply religious and that that portion of the Hispanic population can be appealed to with socially conservative messages. It’s time that the GOP examined President Bush’s 2004 campaign because it’s one of the best campaigns I’ve seen in terms of appealing to the broadest spectrum of voters I’ve seen. You can agree with President Bush’s policies while still learning from his campaign. It’s time we started learning those lessons. If we do, then we’ll refute Mr. Balz’s assumptions. First, it’s important to note that the GOP’s running of spineless moderates have contributed to blowouts the last 2 election cycles. It’s laughable to take their advice seriously, especially with that historical perspective. Second, it’s absurd to think that Charlie Crist is the GOP’s savior, especially considering Marco Rubio is a charismatic, eloquent true conservative whereas Crist might be to the left of Linc Chaffee. There’s a line from the movie Roadhouse that should be applied to the Crist-Rubio matchup. Red, the auto parts store owner, tells Swayze’s character to “never marry an ugly woman. They take all your strength.” The application to politics is that we shouldn’t run candidates that people aren’t excited about. During last year’s primary season, article after article spoke about the Democrats’ enthusiasm gap. Running a lefty like Crist will sap the activists’ enthusiasm quickly and thoroughly. Let’s think of this, too. The energy provided through the tea parties was powerful. Those attending the tea parties are ready for revolution. To run a candidate like Charlie Crist is telling the activists “Start the revolution without me.” Gladly. It’s informative to compare and contrast the 2004 election with the 2006 and 2008 election disasters. In 2004, Karl Rove made certain that the base had lots of things to be excited about. He made sure picking strict constructionist judges was a central theme of the campaign. Tax cuts were another central theme of the campaign, too. Volunteers showed up in droves. I recall reading articles that the Ohio GOP being so overstocked with volunteers that they sent their excess volunteers to Pennsylvania to maximize their efforts in that state. We experienced volunteer shortages in 2006 and 2008, mostly because we ran away from the base of the party. REP advocates new ideas based on well-established conservative principles, such as conservation of the nationâ€™s natural resources, and urges the GOP to recall that Reagan accomodated a range of Republican thinking. I won’t pay attention to that sentence because it’s 100% BS. Reagan was a believer in the big tent but saying that conservation was part of Reagan’s agenda is absurd. One of the first things Reagan did after the inauguration was to end the greencapping of oil wells. He dramatically increased domestic production, too. The tone of the article had the feel of a press release from this obscure organization. That’s what you get from the Agenda Media these days. Unfortunately, it’s what we get from the NRSC, too. Susan Rice: Rove’s ‘Gift’ to Obama? Coinciding with a new poll suggesting McCain has overhauled Obama among voters nationally, Obama’s senior foreign policy adviser Susan Rice portrayed the Republican as a hot-head who could not be trusted to stay cool under fire. “This is a record that belies anything approaching sound judgment,” she said. Ms. Rice obviously wants us to ignore that Sen. McCain was right in his first statement about Putin’s invasion of Georgia. Ms. Rice also wants us to ignore Sen. McCain’s being right about the surge. As for the “shoot first and to ask questions later” part, Sen. McCain called Georgian President Saakashvili hours after the initial invasion to get the scoop on what was happening in Georgia. Meanwhile, Sen. Obama issued a statement calling for restraint from both sides after Russia invaded. Then he left for a week of frolicking on the Hawaiian beaches. It wasn’t until late the next day that Sen. Obama’s advisers, presumably Dr. Rice among them, that told him that his position was politically untenable. Based on Dr. Rice’s statements, statements about foreign policy crises are only measured by whether it puts the candidate in a politically untenable position, not whether it’s actually right. That sounds eerily similar to President Clinton’s foreign policy. That type of thinking doesn’t put Sen. Obama in a flattering light. It makes him look untested. That’s why I’m wondering if Dr. Rice isn’t Mr. Rove’s gift to Sen. Obama.